Condition: Very Good. Light signs of wear. Dire Straits Limited Edition Vinyl Interview Picture Disc...in very good condition! 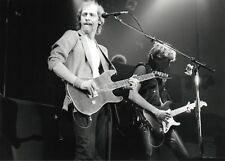 Dire Straits. Countries listed: France, Belgium, Holland, United Kingdom, Switzerland, Austria, Germany, Denmark and Norway. It's an officially released tourbook, but was never sold. It was given away to VIP's and special guests. 1 of 1000 Dire Straits BiA sweater. L-XL. Excellent. Fleece lined. VERY RARE! Brothers in Arms design. 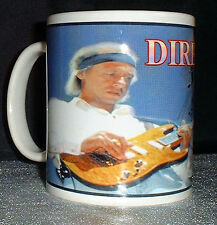 I have other rare dire straits clothing for sale. This is a fantastic quality sweater, thick, fleece lined. ONLY 1000 made . Colours remainbright and white cotton is still remarkably good. Exceptionally rare Dire Straits Alchemy Sweater. L-XL. Excellent. Fleece lined. Alchemy design. I have other rare dire straits clothing for sale. This is a fantastic quality sweater, thick, fleece lined. bright and white cotton is still remarkably good. Colours remain. Pit to pit 56 cm. An original crew jacket from the 1986 Australia & New Zealand leg of the Dire Straits ‘Brothers In Arms’ tour which has been autographed by the group. The navy zip-fronted jacket has a large triangle Dire Straits patch embroidered on the reverse. The concert was one of 55 dates between June and November 1978 which made up the group’s first tour. There is a crease in the upper left corner. The condition is very good plus. A plus or minus after the grading indicates that the condition is marginally higher or lower than the stated grade. This product is not endorsed by or affiliated with Lego or Dire Straits. LEGO is a trademark from the LEGO group and does not sponsor, authorise or endorse this product. The pieces I use are NOT Lego pieces. Paper inner in numbered stickered pvc wallet. This however is very rare and a nice addition to a fan's collection who just wants to own everything Dire Straits related! Can't seem to give this rare item away! Artist: DIRE STRAITS. WEAR TO COVER. Country: UK. Title: LOVE OVER GOLD. Dire Straits - Alchemy Live 12" Promo. Two Young Lovers. ALBUM COVER DISPLAY. ALBUM COVER. have been working for over 20 years. Music Dezigns. Dire Straits - Alchemy Live - PAL Format VHS Tape - Plays Perfectly. Cat No 040 269 2 - (1983). DIRE STRAITS. VERY GOOD & EXCELLENT CONDITION. MARK KNOPFLER. DIRE STRAITS. all carefully CUT OUT from Magazines such as Record Collector etc.mainly from the 00s. Dire Straits Mark Knopfler - Official 1997 calendar - vintage Recently discovered in a box, where it has sat for about 20 years. Although it has a few creases and wear at the corners and at the top, where the pictures are held together, it is in surprisingly good condition. Crucially, the pictures have not faded or been spoiled in any way. All 12 pages are there, with live and session photos. Although it's a Dire Straits calendar, a Mark Knopfler calendar would be more appropriate as Mark is on 11 of the 12 pictures. John Illsley only gets his face on twice! There are some great pictures of a few of his guitars as well. The calendar is 42 cm high, 30 cm wide. From a dog-free and smoke-free home. DIRE STRAITS. Love Over Gold. Tour Programme. 1982 / 83. Unread Condition. DIRE STRAITS. Love Over Gold. Unread Condition. DOUBLE CD DISC PLATINUM PRESENTATION. producing Gold, Silver and Platinum Disc Presentation Awards. The genuine CD's are centered on two LP's. with the CD Booklet and an engraved plaque professionally mounted. MUSIC HISTORY ALL THOSE YEARS BACK;. Williams ran a blues club in Swansea from 2000 until 2007. LYNX ALKATRAZ LIFE-. A GEM OF A ROCK LEGENDARY BAND & ARTISTS CONCERT TICKET WHICH WAS FOR THAT ACTUAL HISTORIC CONCERT ALL THOSE YEARS BACK. AN AMAZING EXCLUSIVENEVER RELEASED PHOTO FROM 1982;. Rare & valuable collectors item! LEGENDS AND HIGHLY COLLECTIBLE AND PRICELESS 1982 ACTION SHOT;. This A3-sized Limited Edition Fine Art Print features a detailed hand drawn illustration of Mark Knopfler's National Style 0 by George Morgan. Mark Knopfler's National Style 0. Imagery detail also changed with palm trees moving from one side to the other, stars and clouds fading, lagoon ripples changing and the whole canoe image reversing direction. Their career spanned 15 years. 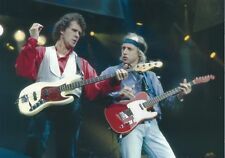 Dire Straits won four GRAMMY AWARDS, three BRIT AWARDS, two MTV VIDEO MUSIC AWARDS, and various other music awards. Rare & valuable collectors item! LEGEND AND HIGHLY COLLECTIBLE AND PRICELESS 1991 ACTION IMAGE SHOT;. Mark Knopfler's National Style 0 resonator. The Style O resonator guitar was one of the strongest icons of Hawaiian music, carrying etched images of palm trees, canoes, clouds and stars. Dire Straits feature on this ticket coaster from a concert at the City Hall in June 1979. 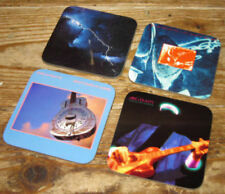 Concert Coasters High quality mdf coaster. Coaster size 95mm x 95mm (3.7” x 3.7”). · 3mm thick mdf that is laser cut around the edges. FULL FRONT PAGE WITH THE DIRE STRAITS "MONEY FOR NOTHING" RELEASE. INSIDE ALSO LISTS THE ALBUM. DIRE STRAITS : RARE DUTCH ( HOLLAND / NETHERLANDS ) PROMO BROCHURE/FOLDER FROM 1988. BROCHURE INCLUDES 1 FOLDED A-3 SIZE SHEET = 4 PAGES TOTAL. 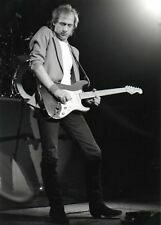 DIRE STRAITS - LIVE IN 85 - LARGE FORMAT TOUR PROGRAMME + TICKETS.